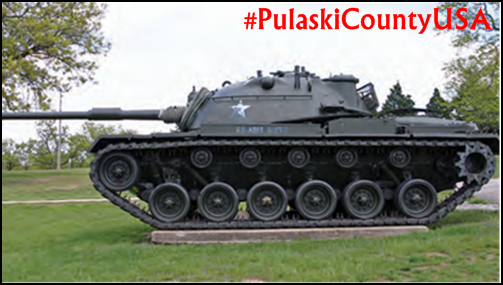 Pulaski County has unparalleled advantages as an ideal site for a military reunion. Pulaski County, MO is the proud home of one of the largest military installations in the United States, Fort Leonard Wood. 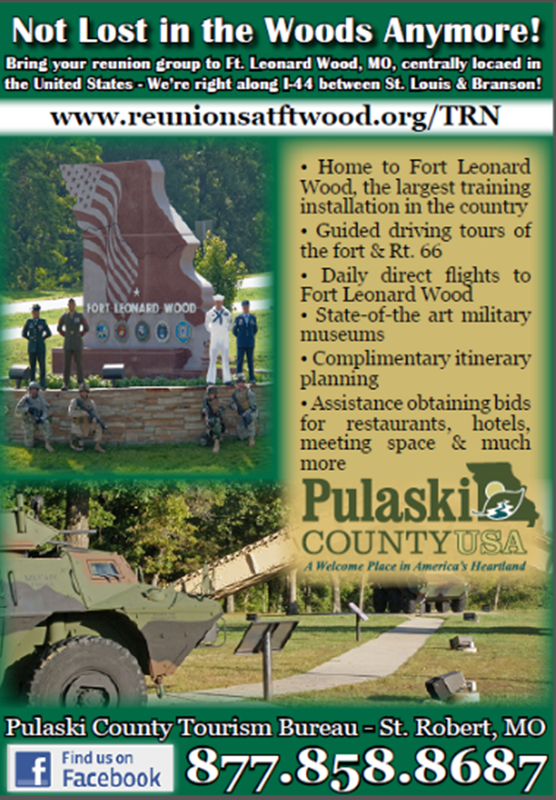 That unique asset-combined with our central location,first class military museums, natural scenic beauty and welcoming atmosphere-gives Pulaski County unparalleled advantages as an ideal site for a military reunion. With the latest additions of the Military Police and Chemical Warfare schools to the existing Army Engineer school, Ft. Wood is the largest training installation in North America. Training includes all three branches of the military—including the Coast Guard and National Guard—and one of the largest contingents of foreign soldiers training world-wide. The post is open to the public and available for tours. Off post has changed dramatically as well. Pulaski County offers more than 39 lodging facilities including bed and breakfasts, motels and large national chains. Choose from over 1,600 sleeping rooms and over 70 restaurants offering hometown flavor (such as lip-smacking BBQ), national chains and many diverse ethnic foods. We’d call it a hideaway if it weren’t so easy to find…By air-fly into the Waynesville-St. Robert Regional Airport or by land-we are centrally located along Interstate 44. Pulaski County is a short drive from Kansas City and Branson, just two hours west of St. Louis and one hour from other enjoyable attractions including the St. James Winery region, the Osage Beach Outlet Mall and Bass Pro Shops Outdoor World. Named after the civilian to the Secretary of the Army, the museum complex houses the rich history and contributions of the Military Police, Army Engineers and Chemical Warfare Units during conflicts dating back to the Revolutionary War. The museum complex is also adjacent to the WWII Army Complex museum replicating Fort Leonard Wood as it was during the 1940s. The Mahaffey Museum began as the U.S. Army Engineer Museum when it moved from Fort Belvoir, VA in 1989. The Military Police and Chemical Warfare schools moved to Fort Leonard Wood in 1999 and brought their respective museums to the Mahaffey Museum Complex. Get insight into the development of the Military Police from Provost to Modern Day Peacekeeper. See exhibits from old cap and ball pistols to modern day equipment. See how the Military Police handled marauders and deserters in the wild western days of the 1800s or prisoners of war during WWI and WWII. View the roles of the Military Police during the Korean and Vietnam wars, as well as, the most recent activity in Somalia and Iraq. Holding facilities like Fort Leavenworth are also featured. display features mines, detectors and foreign armament used to develop land mine warfare technology. There are also models of the many different bridges the engineers build – floating, fixed and mobile and the explosives the engineers use to demolish the same types of bridges. Visitors get a first-hand look at the impact chemicals have had on conflicts dating all the way back to 1100 A.D. First-hand accounts and photographs of chemical warfare from WWI through Desert Storm and projections of future chemical development weave a story of innovation and survival of soldiers and important animals like horses of the Calvary and canines of the K-9 corps and the equipment used to protect them. training over 250,000 soldiers. Since its completion in the spring of 1941, over 3,000,000 soldiers have been trained here and Fort Leonard Wood is now considered one of the premier training installations of the Army and trains soldiers from all branches of the Armed Forces. Pulaski County Tourism Bureau is excited to offer our services and expertise in planning your military reunion. Our partnership with Fort Leonard Wood provides us with many advantages in coordinating a memorable and successful event. Our experienced staff can assist you with many aspects of the planning process. Bring your reunion group to Ft. Leonard Wood, Missouri, centrally located in the United States. We’re right along I-44 between St. Louis & Branson. I have passed along your comment and email to our Pulaski County/Fort Leonard Wood Reunion Specialist, Karen Hood. She will be contacting you soon. You can also reach her at karenh@pulaskicountyusa.com or via phone at 573-336-6355. Thank You! Glenn–Thanks for connecting with us! Karen Hood will be in touch shortly, via email, to answer your questions and to assist you. Her services are free.